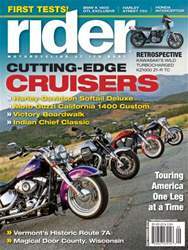 (1 Customer Reviews) | Write Review 12 issues per year Rider magazine's goal is to provide a wealth of information for riders who are less interested in ultimate high-performance but strive to improve their riding skills and enjoyment of everyday motorcycling and motorcycle touring—through both guided and self-guided tours. 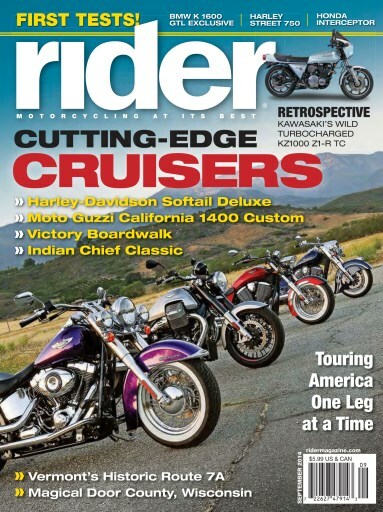 Rider is the premier motorcycle touring, travel and adventure magazine in the United States. The magazine was started in 1974 and is published monthly for readers who look to Rider for the best information on all types of street and adventure motorcycles, places to ride, accessories and maintenance. Many types of bikes and riders participate in the street motorcycle market. Rider is the one magazine that caters to the ranks of mature, serious street and adventure motorcycle enthusiasts, regardless of the type and brand of bike they own. Rider magazine's goal is to provide a wealth of information for riders who are less interested in ultimate high-performance but strive to improve their riding skills and enjoyment of motorcycling. For more than 40 years, Rider's intelligent road tests, travel articles, and How-To features have created a loyal audience of active and informed, real-world street riders. Rider magazine's goal is to provide a wealth of information for riders who are less interested in ultimate high-performance but strive to improve their riding skills and enjoyment of everyday motorcycling and motorcycle touring—through both guided and self-guided tours. You'll receive 12 issues during a 1 year Rider Magazine magazine subscription. This magazine is the best resource I've run across. No matter what your interest area is within motorcycling, Rider Magazine covers it. The contributors are knowledgeable and skilled, yet speak to those with less experience in a way that's understandable and informative. Annual subscriptions are in everyone's Christmas stocking this year! You'll receive 12 issues during a 1 year Rider Magazine magazine print subscription.